George Milne was born in Scotland in 1893 and worked as an engineer on submarines in England during World War 1. In 1926 he moved to Australia where he was well respected for his work in Tyre Design and as a training officer for the Dunlop Cadet Training Scheme. George was instrumental in the formation of the Australasian Section of the IRI and for the active recruitment of new members. He served on the state and national councils in a number of roles including as Australasian Chairman. 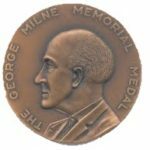 Following his death in 1962 the Institute founded a memorial medal, named after George Milne, to commemorate George and other pioneers of the Australasian Institution of the Rubber Industry and its successors the PRI & APRI. The medal recognises a Member’s contributions to the Industry and to the Institute.